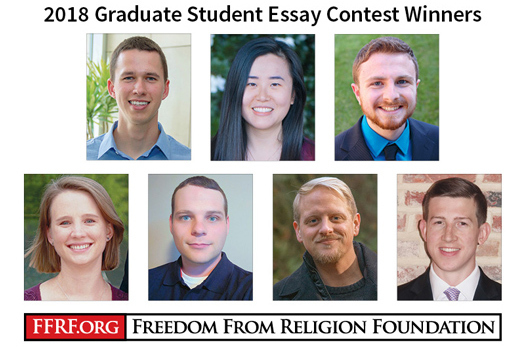 The Freedom From Religion Foundation is proud to announce the 15 winners of the 2018 Brian Bolton Graduate/“Older” Student Essay Contest. FFRF has paid out a total of $10,450 in award money for this contest this year. This is the last of the 2018 essay competitions. FFRF awarded a record total of $46,750 to the student essayists this year among the four different competitions. Winners are listed below and include the award amount and the college or university they will be attending. FFRF also thanks Dean and Dorea Schramm of Florida for providing a $100 bonus to students who are members of a secular student club or the Secular Student Alliance. The total reflects those bonuses. FFRF has offered essay competitions to college students since 1979, high school students since 1994, and graduate students since 2010 and since 2017 a contest geared directly specifically to students of color.